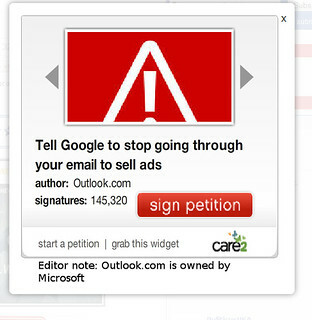 While clicking on a story about Republicans being bribed (old news, yawn) I got a pop-up ad that said, “Tell Google to stop going through your email to sell ads.” (link) It was sponsored by Microsoft’s Outlook.com. I clicked on it and was taken to Care2 to sign the petition. There is an old saying, “Let’s you and him go fight.” Setting two corporations up to fight each other to get a result that you want is pretty clever. We aren’t the only species that thinks so. Here is a video of a crow prodding two cats to fight each other, for entertainment. Now I don’t know if this petition was Care2’s idea and they sold it to Microsoft or the idea came from Microsoft. Care2 is an interesting company and they have clearly put a lot of thought into how to use corporations’ power and money for good. They are also a B Corporation which is a excellent choice for a company. Care2 says their goal is to, “Make it easy for everyone to live a healthy, green lifestyle and impact the causes they care about most.” They have lots of non-profit partners like Sierra Club, Union of Concerned Scientists and NRDC as well as for-profit partners, like PepsiCo’s Gatorade, Ares Management’s Beauty Rest Mattresses and Pfizer’s ADHD drugs. One of components to the Spocko Method is pitting one corporation against another by using Corporation A’s stated values or brand against Corporation B. We contacted an advertiser at Corporation A and pointed out that their brand was being tainted by the comments of a RW radio host employed by Advertiser B. Note, this is NOT a boycott. We didn’t threaten to stop buying product. We convinced one corporation to follow their own stated values and they did. The Spocko Method has been wildly successful. Corporations and syndicators of RW radio hosts have lost 10s of millions of dollars when it was used on them. It is what lead to Glenn Beck getting fired by Fox. It caused Rush Limbaugh’s syndicator to take a massive revenue hit and Rush to lose WABC in NYC. I want to encourage this new activity of getting one corporation to attack another corporation over their policies and suggest to my friends in the progressive activism business to figure out more ways to make this happen. I also think it’s smart to make money off of one company challenging another company to be better. It’s leverage with a pay off. I wish I had figured it out.